I’ve been asked my opinion on the Best Mac Game Controller recently many times, so this weekend I tried a bunch of Mac game controllers out. Even though you may have heard otherwise, the XBox 360 controllers and the off brand versions don’t work consistently. 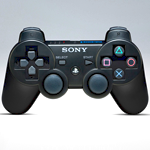 After trying 5 Mac game controllers, the best for the Mac is the PS3 Dualshock 3 Wireless. It connects effortlessly with the help of the Gamepad Companion 2.4, which you can download here for free. The only other thing you need is a USB 2.0 A to Mini-B Cable for charging you controller. Everything else you need to do is covered in the video below. “GamePadCompanion.pkg” is damaged and can’t be opened. You should move it to the Trash. Any suggestion on to proceed? it still says move to trash. Hi there, thanks for this. Been looking for something like this to play The Witcher 2 on my Mac, and this seems to have done the trick. But is it normal to have two separate input windows for games like this? In the Gamepad Companion window, I put in what I think would be the game’s controls, but when I go to play the game, it brings up a different window with completely different inputs. It is quite confusing 🙁 Do you have this game? If so, have you done this successfully, and how did you do it? I get the GamePadCompanion.pkg is damaged message too. Downloaded it twice, same result. The error message “”GamePadCompanion.pkg” is damaged and can’t be opened” is a message referring to the system security settings you currently have enabled on your Mac. To disable open up your “System Preferences” then goto “Security & Privacy” and under the general tab at the bottom list “Allow applications downloaded from:” you should choose anywhere. You can change it back after the installer has run but had the same issue on my Mac and doing this worked like a champ. Best of luck!!! Try extracting directly into Applications, I too received the “damaged” error and extracting it to my Applications directly allowed me to open the .pkg to install. does this work with any kind of controller (american, canadian… etc) if yes then everytime i connect it it just randomly disappears, how can i fix this??? I’ve only tested it with one I bought in the US. I didn’t know there was a difference. have you tried this method with a game called Shank from the app store? Yes actually. It is funny that I have it since I don’t have many games. Hi, I managed to install Gamepad companion but after opening it a number of times the application stopped responding and now it says “Could not load Gamepad Preference Pane”, whenever i try to launch it. I have been told that is happening because of Gatekeeper on Mac OSX. You can get rid of that by shutting off Gatekeeper. Thanks for the tutorial! Any trouble with Mavericks? I’m going to buy a PS3 Dualshock 3 Wireless for this. You’re very welcome 🙂 If you shut off Gate Keeper you should have no problems with this. I downloaded and used Gamepad Companion 2.4, mapped all the buttons for Left 4 Dead 2 and while in the game the joystick mapped to the mouse movement was overly sensitive and kept activating my Hot Corner commands. So I tried stopping the gamepad from going but the window for it wouldn’t respond. I force quit System Preferences and now whenever I try ti reopen Gamepad Companion in system preferences I get an error message “Could not load GamePad Companion preference pane.” I have deleted and re-downloaded many times now and still this message appears. Any thoughts on how to fix this? Make sure you completely delete the files and the preference pain. Shut of gatekeeper and then reinstall. It seems to be a problem with mavericks. Nice Mac Game Controller tutorial video — so clear and well-articulated. I often wonder why Apple doesn’t get its act together with gaming and come up with a standard that would allow anyone to easily use an Apple-branded gamepad, and avoid the all this anarchy. Maybe some future release of AppleTV will see it come to fruition, but I doubt it. I have no idea what is going on at Apple. From a developers perspective they have pretty much wrecked OSX. I haven’t upgraded for years. I guess they decided it was more profitable to aim at kids rather then their core audience which is into development, graphic design, video editing, etc. It seems pretty obvious that without Steve it will be a never ending spiral down? Sorry the new OSX may have broken it. I haven’t upgraded OSX for 3 versions because I didn’t like the direction it was going.